Try something different in September. 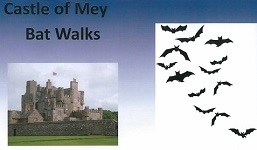 Check out the bats at Castle of Mey. 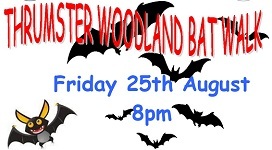 The rangers will take you out and show you around the places where bats hang out at the castle. Thurso Players are perfoming the Wizard of Oz for 4 nights from Wednesday 6th September at Thurso High School. Tickets are on sale from McBeaths Jewellers in Thurso or you can phone to book them. A rare chance to see live performance of this well loved musical and a great family night out. Highland Council is reassuring all pupils, parents and carers this morning (23 August) that all school transport routes have been covered in Caithness and East Ross following the loss of the contractor Andrew's (Shetland) Ltd. who ceased trading last night (22 August). Bill Alexander, Highland Council's Director of Care and Learning said: "This is wonderful work by our Transport colleagues and partners who swiftly managed to get replacement services up and running for this morning." The Council warns however, that there may still be some gaps on public service routes. Link to new timetable on the page inside. Parents and carers of pupils using Andrew's (Shetland) Ltd coaches for Thurso, Wick, Dornoch, Golspie and Invergordon High Schools and some of their associated Primaries are warned for possible disruption to transport arrangements from tomorrow morning Wednesday 23 August 2017. Highland Council has been notified that its school transport contractor Andrew's (Shetland) Ltd has ceased trading as of this evening (Tuesday 22 August 2017). The final trip of a post bus in Scotland took place on Saturday 19 August 2017 on the route between Lairg and Tongue in Sutherland. Bill Fernie went to meet Geoff Marshall and Vickie Pipe on Saturday 19th August 2017 as they arrived at the final station - Wick after 104 days in their quest to visit all of the railway stations in Britain. Bill gave them a small Caithness flag to celebrate their final station - number 2563 - Wow. They have videos all along their route and kept up an endless stream of photos and contacts on social media. The bouncy enthusiastic pair have carried their selfie cameras all the time and constantly made short film clips to be edited into very professionally edited films for their Youtube Channel - All The Stations. A great record of what the stations and indeed the railways are like in 2017 and well worth dippiing in to see their little films. They are still editng the final ones so keep watching. Meet the MPs is an ambitious online series which will introduce the colourful new personalities who have recently joined Westminster's green benches following June's General Election. Each episode features a quick-fire Q&A with an MP from the 2017 intake. Why is this different? In short, it is the questions that they weren't expecting (we weren't always expecting the answers that came back either). The episodes are fun and informal while also revealing more about the new voices in the Commons. The phone at Reay telephonebox has gone and at some point the actual box may be removed so a few photos for future reference to add to those taken 15 years ago in 2002. More telephones are going and BT has proposed now to take out half the remaining boxes. It is 60 years this weekend since the first criticality was achieved in Scotland using a test rig at Dounreay. Now the decommissioning team responsible for the site is marking that milestone by taking a major step towards demolishing the oldest reactor that remains at the former fast reactor research centre. Companies are being invited to bid for a contract to demolish the iconic Dounreay Materials Test Reactor (DMTR) which became Scotland's first operational reactor in 1958. DMTR, which was built with steelwork weighing in at almost 600 tonnes and stands on foundations more than 25 metres in diameter, tested the effects of irradiation on metals and was the only reactor on the site to use heavy water instead of liquid metal as a coolant. All babies in Scotland due from today 15 August 2017 will be gifted a box full of essential items aimed at tackling inequality and promoting health. The boxes are a strong signal of the Scottish Government's determination that every child, regardless of their circumstances should get the best start in life. Each Baby Box contains a large number of items which are not only practical but designed to help tackle inequality and improve health. The box itself also doubles up as a safe sleep space, awarded British Safety standard accreditation as a crib for domestic use. Join poet and playwright George Gunn on your personal creative journey from the poem, through the short story to the formal destination of the stage play. In these 16 workshops we will look at how poetry generates story. From that beginning you will explore the requirements of short narrative fiction. From the short story, you will move on to the demands of public storytelling which is the business of the theatre. Ravenskald is a new venture. The group will develop creativity through interaction, constructive criticism and mutual support. All you need is the desire to dream, to create, to write. One hundred and forty two probationer teachers who are on the Teacher Induction Scheme and a few probationer teachers on the Flexible Route were recently welcomed to the Highlands. Of the 142 probationers on the Teacher Induction Scheme, 58 have been allocated to secondary schools and 84 to primary schools in the Highlands. The gravels and sediments of the Kildonan Burn are salted with small concentrations of gold in the form of tiny granular flecks, and the very occasional little nuggets sometimes combined with quartz. The Helmsdale river valley offers a sheltered and pleasant route to the banks of the Kildonan Burn, signposted as Baile-An-0r, the Gaelic translation of Town of gold. 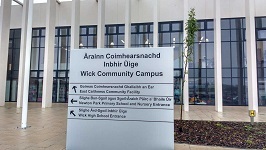 Highland Council has written to the Wick Stakeholder Group, Wick High School Parent Council and Newton Park Primary School Parent Council to provide a statement of assurance regarding the new Wick Campus facility. The Campus is a fantastic facility and a tremendous asset for the Community. We believe that all stakeholders can now look forward confidently and with pride in one of the best public facilities in the Highlands. The Council looks forward to welcoming pupils back for the start of the new school year.